Lending credence to the widely-held belief that athletes are morons, LaVar Ball was interviewed by CNN’s Chris Cuomo. Ball is still suggesting that President Trump did nothing for his son and deserves no thanks. 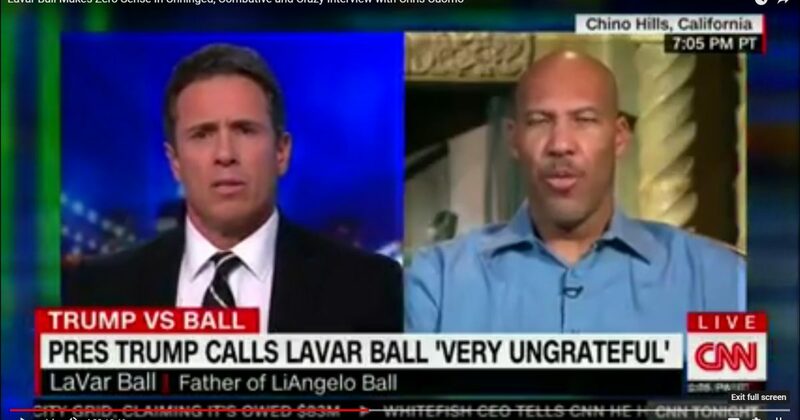 CNN hyped up a Monday night interview with nutso sports dad LaVar Ball, who recently got himself embroiled in a feud with President Donald Trump. As you may recall, Ball’s son LiAngelo and two other UCLA basketball players got themselves in hot water over shoplifting charges in China. Following Trump’s visit to Asia, the players were allowed to return to the United States, leading Trump to ask if they would thank him. While the players quickly did, LaVar Ball downplayed the president’s involvement, causing Trump to lash out at him on Twitter.